Title The / New Testament / of Our / Lord and Saviour Jesus Christ: / First Published by the English College at Rhemes, A. D. 1582. / Translated From / The Latin Vulgate: / Diligently Compared / with the Original Text, and Other Editions in Divers Languages. / with / Annotations, / Comprising those of / Drs. Witham and Challoner, and a Selection from Other Approved / Commentators. / Enriched with Four Superb Engravings. / Manchester: / Printed and Published by M. Beegan and Co. / at Their Catholic Publication Warehouse, 2, Cumberland-Street, / Deansgate. / 1816. 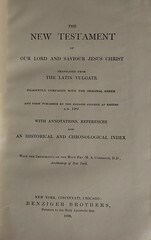 Comments An edition with the extended commentary format made popular with the Haydock Bibles (q.v.). 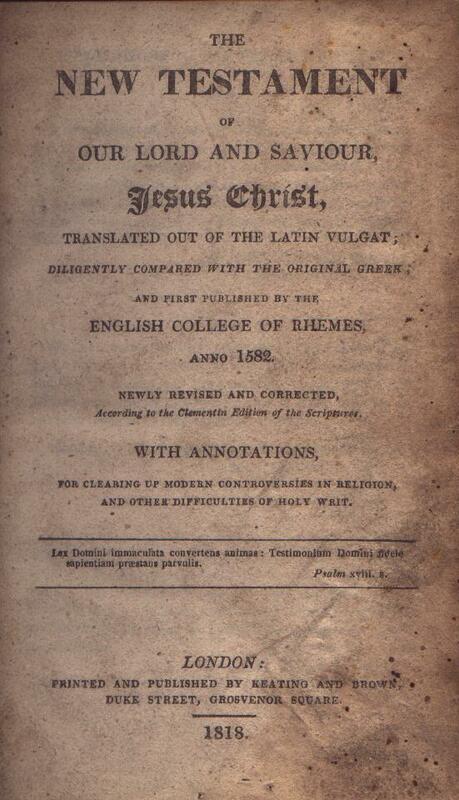 Title The / New Testament / of / Our Lord and Saviour, / Jesus Christ, / Translated out of the Latin Vulgat; / Diligently Compared with the Original Greek, / and First Published by the / English College of Rhemes, / Anno 1582. / Newly Revised and Corrected / According to the Clementin Edition of the Scriptures. / with Annotations, / for Clearing Up Modern Controversies in Religion, / and Other Difficulties of Holy Writ. / London: / Printed and Published by Keating and Brown, / Duke Street, Grosvenor Square / 1818. Title Translation / of the / New Testament / of Our / Lord and Saviour / Jesus Christ, / from the / Latin Vulgate. / Published by Authority, / and / Diligently Compated with the Original Greek. / London:`/`Printed for Samuel Bagster, / Paternoster Row, No. 15. / MDCCCXXIII. Comments Reprint of the 1815 "Catholic Board" edition. 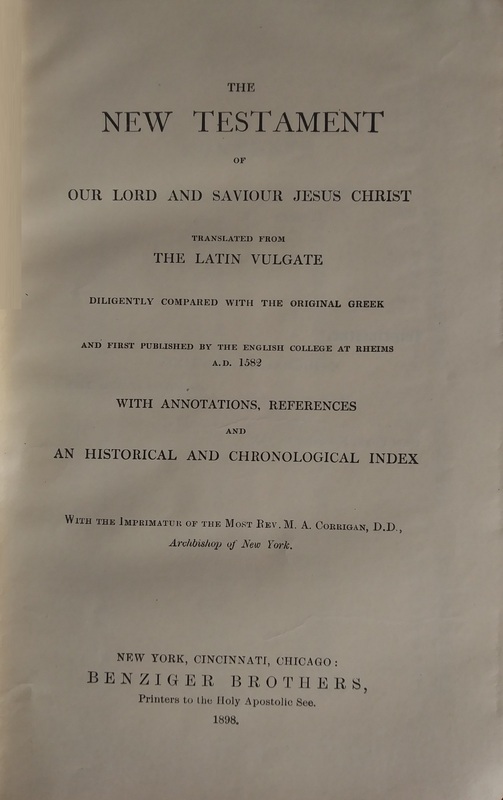 Title The / New Testament / of / Our Lord and Saviour Jesus Christ / Translated from / The Latin Vulgate, / Diligently Compared with the Original Greek, / and First Published by the English College at Rheims / A.D. 1582. / with Annotations, References, / and an Historical and Chronological Index. / with Lawful Authority. / London: / Burns, Oates, and Company, / 17, 18,Portman Street and 63 Paternoster Row. Comments Originally published when the firm was known as Burns & Lambert. Copies also appeared with Irish and American imprints. Reprints Of The Burns Lambert/Benziger Brothers 16mo. Title The / New Testament / of / Our Lord and Saviour Jesus Christ, / Translated from the Latin Vulgate, Diligently Compared / with the Original Greek, and First Published by / the English College at Rheims, A.D. 1582. / with Annotations, / References, and an Historical and Chronological Index. / First Published with the Approbation of / His Grace The Archbishop of Westminster. / London: Burns and Oates. / 1873. Comments Also published with an American Imprint (see following). 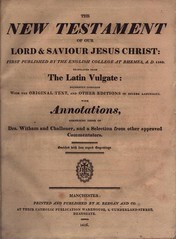 Title The / New Testament / of / Our Lord and Saviour Jesus Christ / Translated from / The Latin Vulgate / Diligently Compared with the Original Greek / and First Published by the English College at Rheims / A.D. 1582 / with Annotations, References / and / an Historical and Chronological Index / With the Imprimatur of the Most Rev. M. A. Corrifan, D.D., / Archbishop of New York. / New York, Cincinnati, Chicago: / Benziger Brothers, / Printers to the Holy Apostolic See. / 1898. Comments The American variant of the above.